A customer asked me if I could crochet her a large plastic bag tote to store her paper for recycling. She wanted a very large tote bag 18 inches wide, with a 7 inches base and 12 inches tall. Of course it had to have handles for carrying and be made from recycled plastic bags. 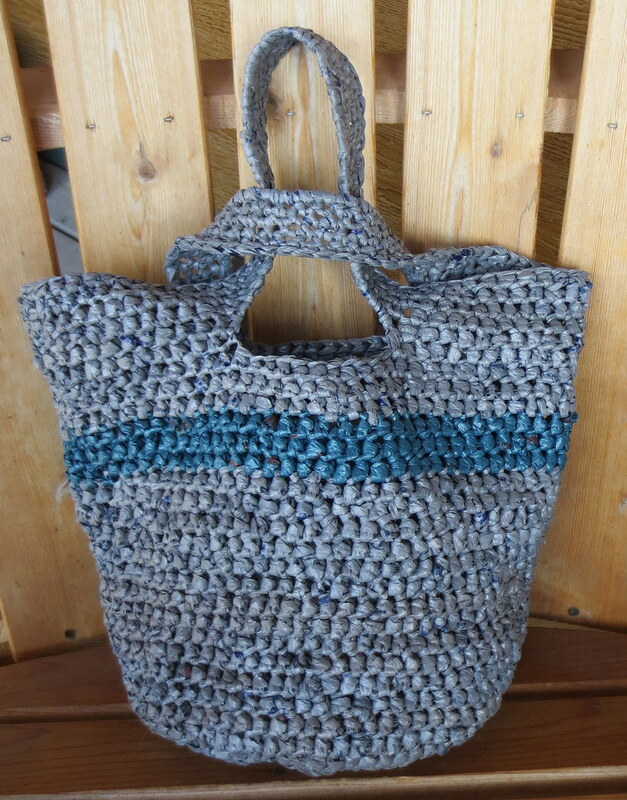 I love a challenge and to crochet such a recycled tote bag was fun. 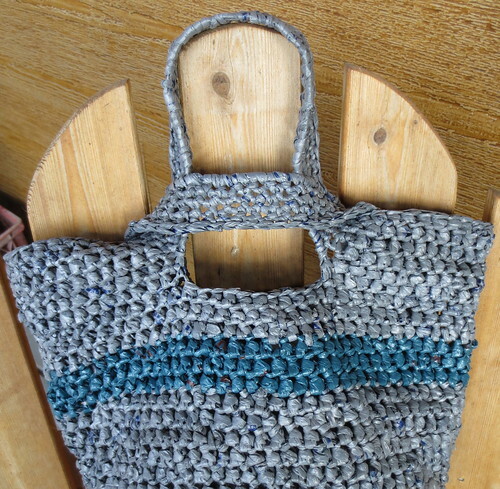 I used around 90 recycled plastic sacks cut 1 inch wide to complete this recycled paper holding tote. I used the double strand plarn making method to crochet this tote. Here are a few photos of the completed bag. 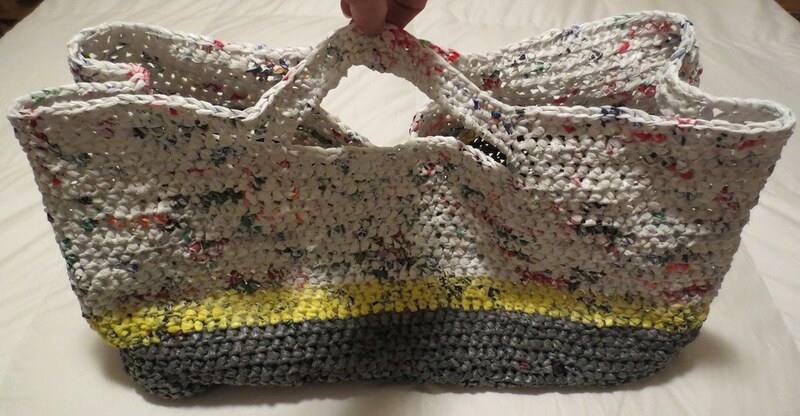 Here is a new recycled plastic bag yarn project. This pattern is called a Japanese Knot bag as it features 2 handles. One long and one shorter, which closes by sliding the longer handle through the shorter one as shown. The Japanese-styled bags are often times made smaller and worn over the wrist. 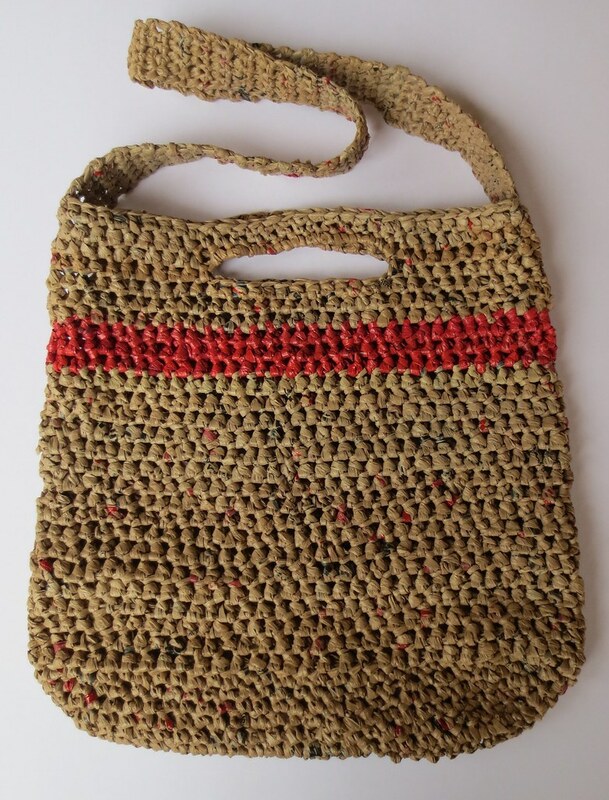 This tote bag is crocheted using recycled plastic bags made into yarn known as plarn. It can be worn over the wrist or also draped over your shoulder. Here is the free Japanese Knot Bag pattern written using plarn but it also can be crocheted using bulky yarn or 2 strands of worst weight yarns held together. I have a new resource for brown plastic bags! Local Safeway stores have gone back to the brown plastic retail bags and I just love recycling them into new reusable tote bags. 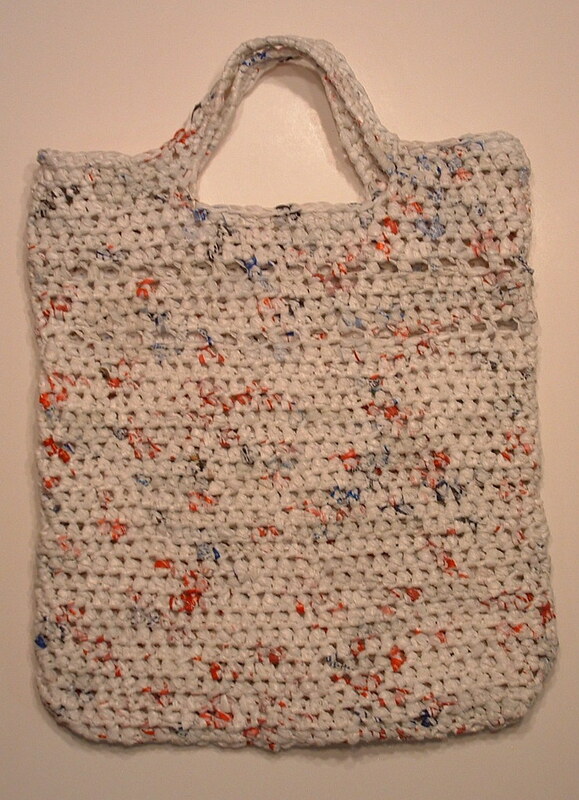 Here is the recycled plastic bag or plarn tote bag I crocheted with the brown retail sacks. I also used some red plastic newspaper bags that an on-line friend sent me that her Wall Street Journal was delivered in. The red bags were just right to compliment the brown bags with the red writing on them and made for a nice stripe on the tote bag. But the special thing about this recycled tote bag is the dual handles. It has the normal hand grip handle in the middle and also a 30 inch long shoulder strap. So you can either grip the bag with your hands or throw the long strap over your shoulder. 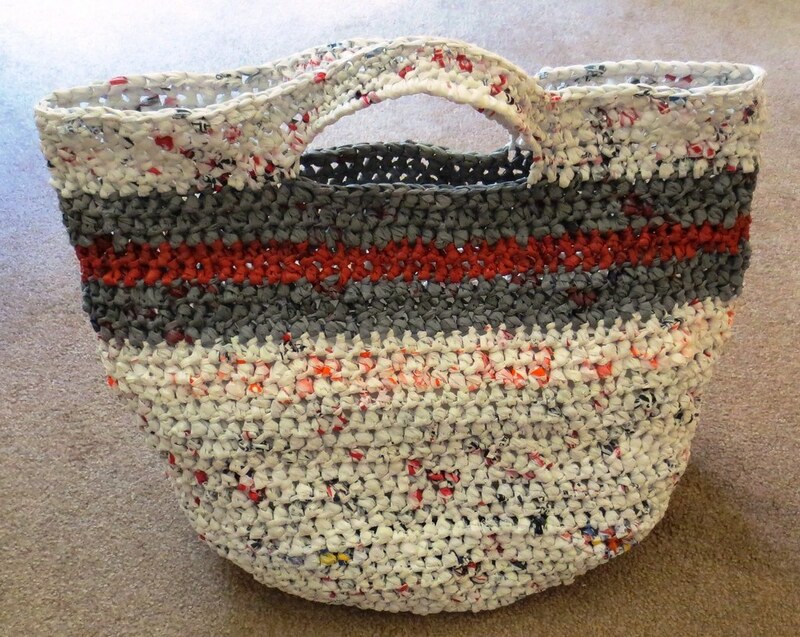 I crocheted this latest recycled plastic bag or plarn tote using lots of white plastic bags and a few red and grey plastic bags. Recycling all the white retail plastic bags I get can be challenging. Let’s face it, the white bags are boring and need something to help brighten up the project when you crochet or knit with them. So by adding some colorful bags, I created a few stripes to spice up this recycled tote bag. 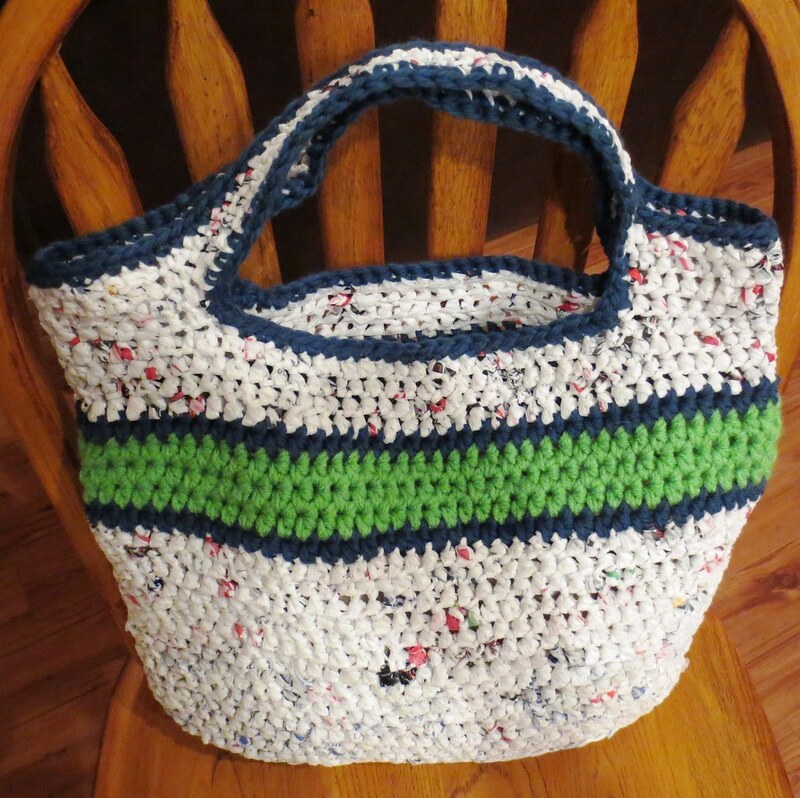 I used the free recycled round grocery tote pattern to crochet this bag. I just changed up the stripes of colored plarn a bit for a different look than the original pattern. But otherwise it’s the same pattern. As with any pattern, you can always just make a few changes which will result in a new look. Here is my latest recycled plastic tote bag. 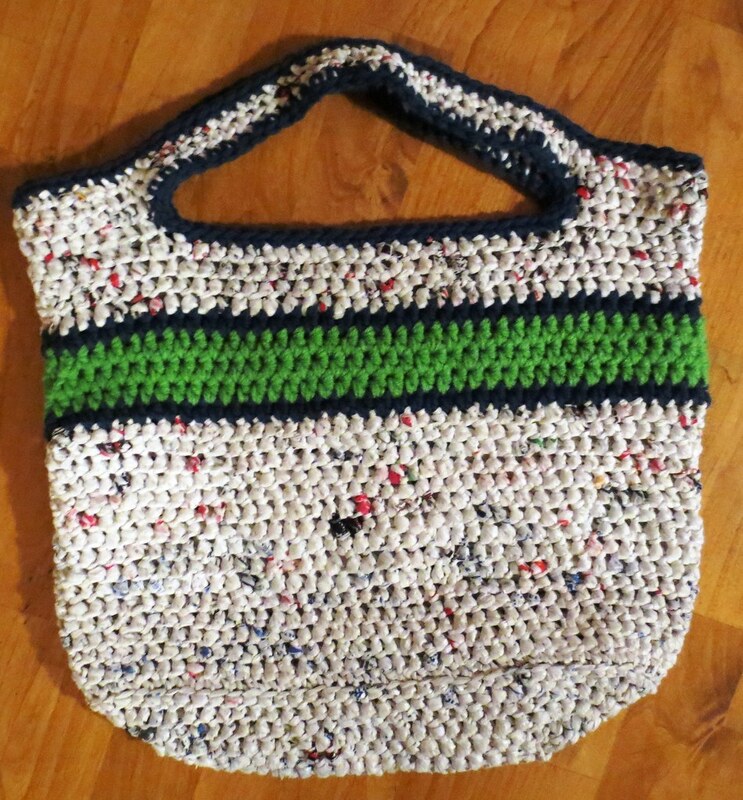 It was inspired by the Seattle Seahawks and I used their team colors when I crocheted the tote. 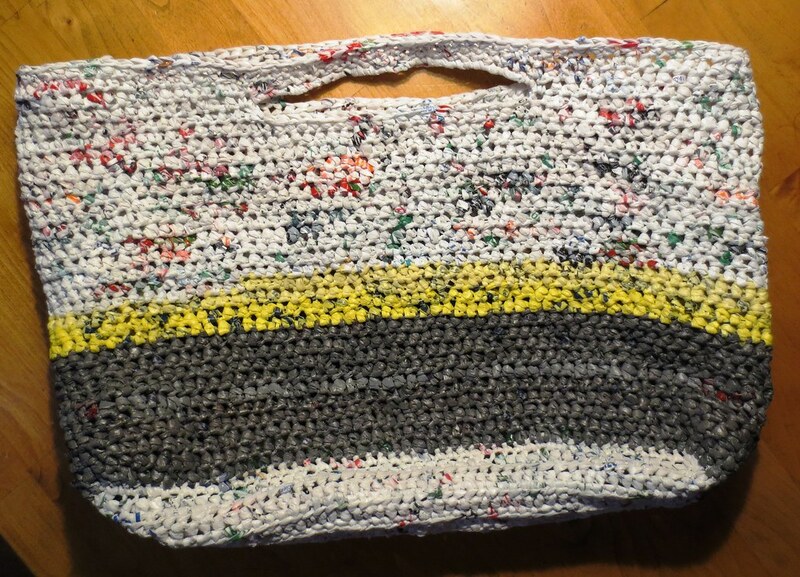 I used what I loving call boring white plastic bags in this crocheted tote bag. White plastic bags are very plentiful but need something to spice them up so blue and apple green acrylic yarn in Seattle Seahawks colors were added for stripes and trim. I crocheted the tote bag using my flat bottom tote bag pattern. The crochet pattern is free and you just need to alternate some crocheted stripes using your favorite team colors as shown. Adding colorful yarns is a great way to pretty-up those boring white plastic bags and you end up with a cool-looking recycled tote bag. Here is a photo taken laying flat of the recycled plastic tote bag. I’ve had this idea in my head for awhile on how to create a tote bag that fades from black to white using recycled plastic bags or plarn. Here is what I came up with. I used recycled black plastic bags to start and then grey bags to the dirty-white colored bags and ended with white plastic bags. 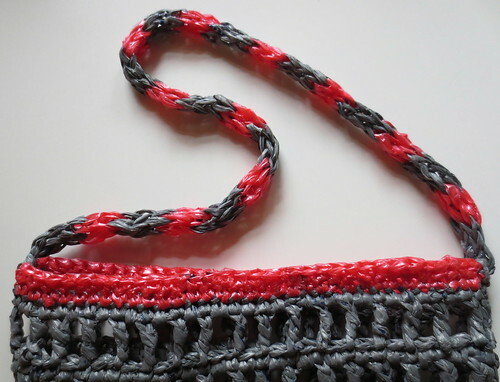 I used the ultimate plarn tote bag pattern to crochet the bag with just some minor changes. On round 3 at the curve of the ends, I crocheted 2 Half Double Crochets (Hdc) in the first stitch at the curve. Then I worked just 1 Hdc in next stitch and 2 Hdc in the stitch at the other part of the curve. Repeat for the other side’s end. For round 4 curve, you want to identify the 4 stitches on the curve of each end. Crochet 2 Hdc in the first stitch, then 1 Hdc in each of the next 2 stitches and 2 Hdc in the next stitch. Repeat for the other end. This should give you a nice rounded corner on each side of your bag. Time to share a new recycled bag project. I’ve been busy with charity crocheting but rest assured, I’m always working on recycled craft projects too. 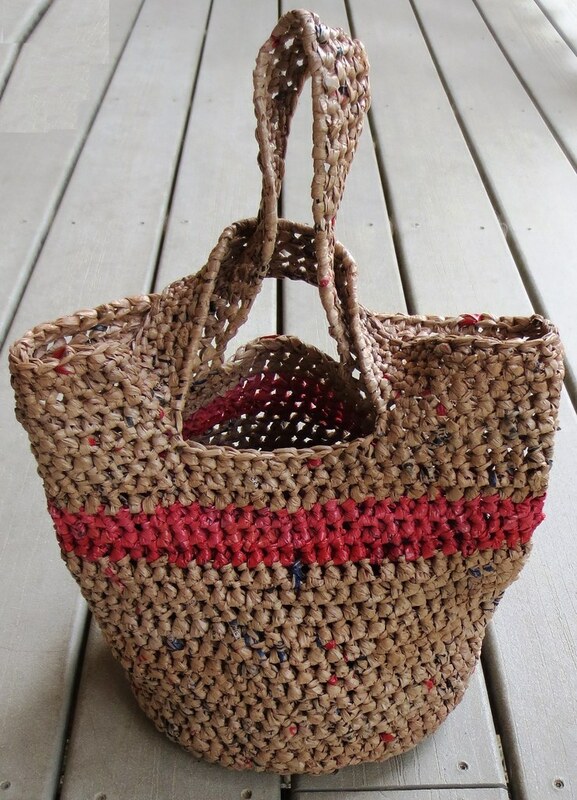 Here is a recycled bag that features a double picket stitch design. 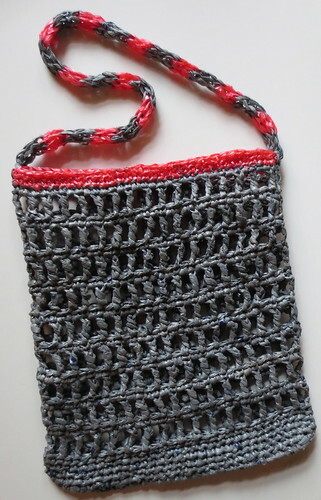 In the original Plarn Picket Stitch tote pattern, I crocheted just a single picket stitch on the plastic bag tote. In this tote bag, I repeated the special stitch pattern to add a different look to the project.